So I’m 3 weeks into learning Python and overall I feel pretty good about my progress. But this past week was a bit tricky with the 4th of July weekend and all. So as you can probably imagine how I allowed the festivities to railroaded a few of my plans, but not all of them. I was still able to crank out a few things. 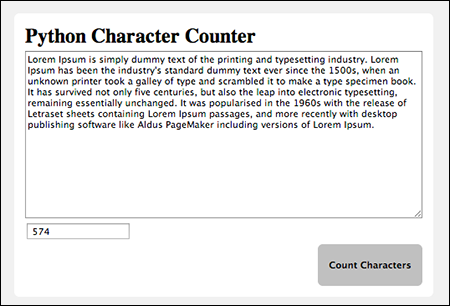 For starters I built this Python Character Counter script for both personal and work use. It’s small and simple so you’re probably thinking “What this about?”. Well at the time I couldn’t think of anything else plus I knew this could be whipped out quickly. But believe it or not something as simple as a web form with a Len() Method will end up being one of the most useful tools I end up using. In my line of work there seem to always be a need for a string or phrase counter. And a tiny script like this surely beats out firing up Microsoft Word each time. The other part of my week was spent digging through the web trying to figure out how other Python programmers work, what tools they use and what’s considered a normal workflow. Finding the perfect workflow seems to be the most important thing for me right now. In my opinion if what you’re doing doesn’t feel right, then you’re just limiting your potential. For example the Python code I’ve been writing was written using VIM text editor and to be honest my VIM knowledge is limited. I can fumble through a few commands but that’s about it. Funny thing, I know some old school hackers who prefer VIM over any other editor and I have to admit these dudes look pretty smart crushing code, but again that’s not me. So until I run across a suitable FREE IDE to complete my workflow, I’ll be churning along with VIM.